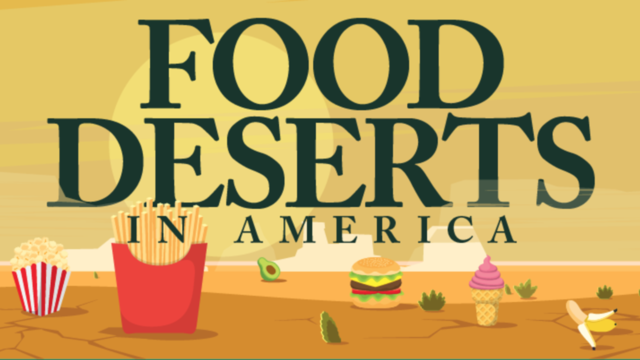 According to the American Nutrition Association, food deserts are geographical areas that lack sufficient supply of fresh vegetables, fruits, and healthful, affordable whole foods. Food deserts are generally impoverished areas and they are viewed as a national crisis. Fortunately, nonprofit organizations and government initiatives are in place to provide relief for affected Americans. Earn your <a href="https://socialwork.tulane.edu/">online MSW</a> from Tulane's School of Social work and find out how you can help fight food deserts. As of 2009, about 2.3 million Americans did not own a car and lived over one mile from a supermarket. This figure consists 2.2% of the total households in the U.S. In a 2006 survey, about 500,000 city residents in Chicago were living in food deserts. In New York, a 2009 survey revealed that 750,000 Americans lived in areas where access to healthy food options was difficult. There are difficulties that affect individuals who live in areas classified as food deserts. Due to the lack of availability of certain foods, many people are unable to satisfy their need to enjoy culturally appropriate food. People who suffer from conditions such as gluten allergies and lactose intolerance also have limited meal options. Healthy, whole foods tend to be more expensive than unhealthful fare. Often small supermarkets and grocery stores in food deserts may show a price variance that makes healthy food less desirable for people who cannot afford them. The time and travel cost of finding healthful food also make fast food a preferable option over prepared meals. According to a National Center for Biotechnology Information article, studies show that people who live in neighborhoods where availability of healthy food is lowest are 55% less likely to enjoy good-quality diet compared to those who have better access to healthful food. People who live in neighborhoods availability of healthy food is greater have a 45% reduced incidence of diabetes over a five-year period. The economic environment also affects health. Families that move to non-poor neighborhoods show a significantly reduced body mass index (BMI). According to a press release by the United States Department of Agriculture Food and Nutrition Service, a food desert is an area where 20% of individuals have an income that is at the federal level of poverty or lower in terms of family size or an area where 80% of the median income of the family is at 80% of the median level set for family income of the surrounding area or lower. The SNAP or Supplemental Nutrition Assistance Program offers an average of $29 worth of food per week. According to studies, the prices of food are affected by the type and availability of stores in the area. The price of milk, for example, is notably lower at supermarkets than stores that offer limited services. Smaller stores also sell items at higher prices than supermarkets do. Isolated, smaller stores sell at higher prices than non-isolated stores. These factors impact the buying decisions of individuals since the price is one of the most important considerations when choosing where to buy staple food. For individuals who do not own a car, distance is also a factor. Distance adds to the cost of acquiring food as well - the transportation from a food desert to a supermarket can cost from $5 to $7. The Healthy Food Financing Initiative was announced in 2010. The goal is to make grocery stores and retailers selling healthy food more accessible to underserved urban and rural areas across America. According to the Department of Health and Human Services, small retailers, farmer's markets, corner stores, and grocery stores that sell health food will be equipped for this effort. The Let's Move! campaign, also launched in 2010 by former first lady Michelle Obama, aims to provide healthier fare for young children. Salad Bars to Schools, for example, provided a salad bar to 3 million students and the Health, Hunger-Free Kids Act has increased funding for school meals and snacks to feed more than 50 million kids. Nonprofit organizations such as Fresh Express has also made healthful food more accessible. Fresh Express is a mobile food truck operated by Discovery Triangle. It purchases food directly from farmers at wholesale, then sells it at no profit. It is essentially a grocery store on wheels that sells fresh fruits and vegetables to communities including schools, apartment complexes, senior centers, and health clinics across Phoenix and Tampa, Arizona. The operational costs of nonprofits such as Fresh Express are made possible through grants, donations, and sponsorships. Another such initiative is the Twin Cities Mobile Market, a program of the Amherst H. Wilder Foundation. This grocery store on wheels serves under-resourced areas in Minnesota. A $29 worth of purchase from the Mobile Market offers a wider array of healthful food choices than the same amount at a convenience store. The Choose My Plate program is supported by the United States Department of Agriculture. Choose My Plate is a reminder to maintain healthy eating habits by providing an easy-to-follow meal structure. The program encourages communities to choose foods and beverages that contain less sodium, saturated fat, and added sugars. It also recommends implementing small changes to help people build healthier eating styles. There are also several online tools that individuals may use. SuperTracker, for example, helps plan, analyze, and track diet and physical activity. It also offers groups to motivate users to complete various challenges. What's Cooking? is a searchable database that contains healthy recipes that offer users options to build a cookbook, print recipe cards, and share recipes through social media. Portion Distortion offers a link to quizzes on recommended food portions on the National Heart, Lung, and Blood Institute (NHLBI) website. Daily Checklist offers information on what and how much to eat based on one's age, gender, height, weight, and physical activity. Quizzes test knowledge of dairy, fruit, grains, protein, and vegetables. BMI Calculator offers links to the Centers for Disease Control and Prevention website. The number of tools and resources that Americans across the U.S. can use will hopefully help eradicate the problem of food deserts. In the meantime, nonprofits and government organizations will continue working with social workers to address the concerns that food deserts pose. Wide-ranging efforts that include education, advocacy, and raising awareness will be useful in helping individuals living in food deserts to make better food choices and ultimately enjoy healthier, happier lives.